It wasn’t all that long ago that there was no mid-tier market for solar energy-energy storage. That’s changed pretty radically in a short span of time as a result of efforts by pioneering startup and government support for development of low or emissions-free energy generation and grid modernization. 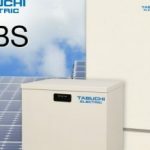 Sharp Electronics Corp.’s Energy Systems and Services Group (ES&S) on Sept. 8 announced it is allocating $25 million to finance commercial & industrial (C&I) projects that combine solar PV systems with its ¨behind the meter¨ SmartStorage energy storage system. Sharp’s new C&I solar plus storage financing program is open to both end users and project developers. 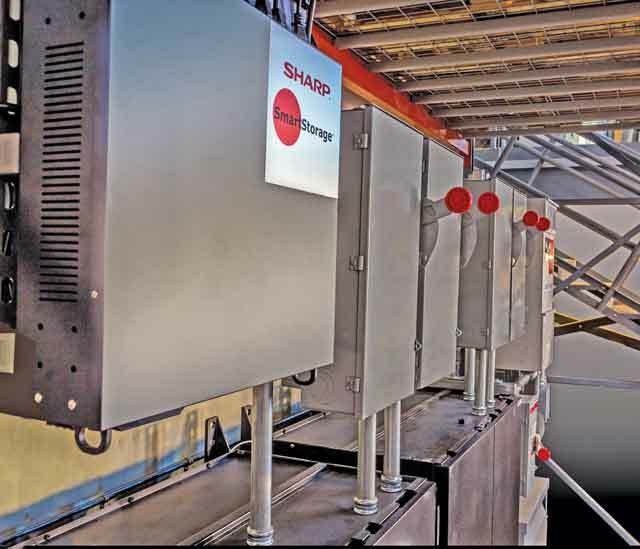 With an initial $25 million in funding, Sharp expects to finance more than 12 megawatts (MW) of hybrid solar-storage systems within the next 12 months. Developing pioneering intelligent, lithium-ion battery-based energy storage management systems (BESS) venture capital-backed startup companies such as Santa Clara, California-based Green Charge Networks blazed the trail and began opening up the mid-tier C&I segment of the energy storage market. Integrating these systems with solar PV systems was a natural progression, one that Tesla recently highlighted by bidding to acquire SolarCity. 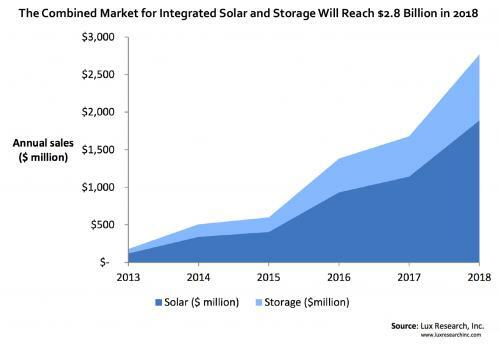 Lux Research calls for the distributed energy storage market to reach $8 billion in 2026. That said, the market is still at an early stage of development. Sharp is looking to replicate the success of third-party solar leasing/installation companies, such as SolarCity, by offering attractive long-term financing. Sharp’s new C&I solar-storage financing packages includes zero down payment for qualified customers. It also includes Sharp’s 10-Year Asset Management Service Agreement and Demand Reduction Performance Guarantee. The solar PV component of the hybrid systems Sharp ES&S will finance reduces energy usage in a C&I facility while the SmartStorage BESS reduces usage during peak periods of demand, both of which reduce end users’ monthly utility bills. ¨Reducing peak demand usage is becoming increasingly important since demand charges are the fastest growing part of many utility bills for C&I customers and can represent up to 50 percent of a company’s monthly bill,¨ Sharp points out. Green Charge Networks has taken this approach in building its business, which is focused in states where utility demand charges are high and incentive programs are on offer, such as California and New York. This May, France-based multinational electric utility and energy services company Engie (formerly EDF Suez) acquired an 80% equity stake in Green Charge for an undisclosed sum.